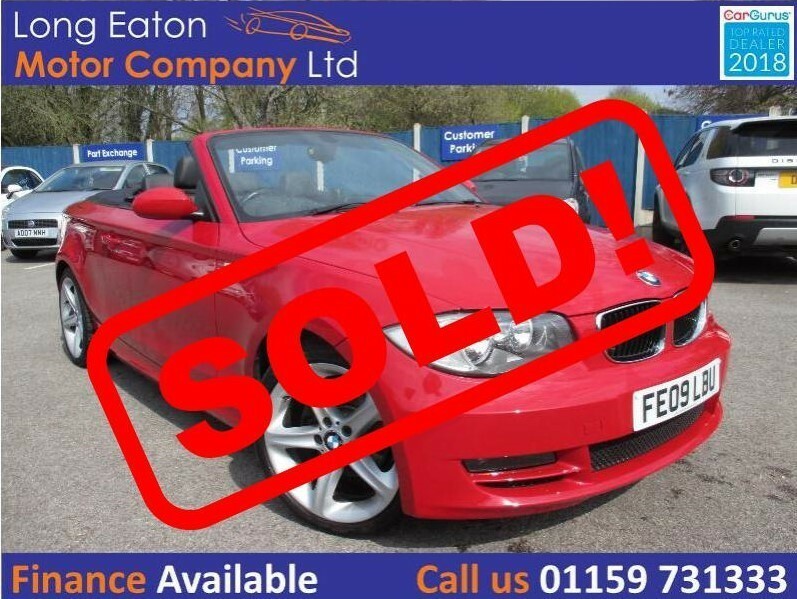 ***** SOLD ***** 2009 BMW 1 Series 2.0 SE Convertible in the beautiful Crimson Red with a full black heated leather interior. Equipped with climate control, AUX/USB connectivity, rear parking sensors, 18 inch alloys and much more! Supplied with a FULL DOCUMENTED SERVICE HISTORY last recorded at 45431 miles on 18/08/2018, 2 keys and a brand new MOT. Tailored finance packages available to suit your needs, existing finance agreements settled. Parts and labour warranty included plus free AA membership to be claimed. All vehicles HPI checked, no extra fees or hidden charges. Call us today to find out more or just email us your details and we will call you at your easiest convenience. We are a family owned and run business based on Nottingham Road, Long Eaton, NG10 2EQ.